As summer turns to fall, you should make sure your deck is in the best shape possible. As summer turns to fall, you should make sure your deck is in the best shape possible. 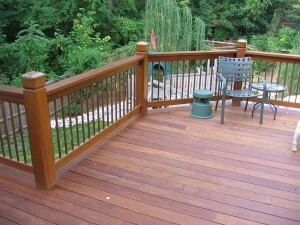 Sun exposure and the ravages of wind and rain can make your deck look old and boring. How do you keep your it looking brand new? Here are some useful tips to consider the next time you step outside to take care of your outdoor living space! The first thing you should do is keep your deck clean. Much like anywhere in or around your home, cleanliness is next to perfection. Sweep leaves and any other buildups off your deck twice a week. As fall settles in, the leaves will change color and start to wither. Eventually, leaves will start piling up all over your yard – including on your deck. Don’t use planters, either. Planters can leave water and dirt stains that are distracting, not to mention unsightly. Make sure your garden is thriving, but don’t allow it to reach your deck. It will rain a lot during the late summer and early fall, which means your garden will get plenty of water. So, how far apart should the patio and the garden be? A foot should be far enough, but keep an eye on your shrubs, plants, and trees – they’re breeding grounds for moss, mold, and mildew. No matter how old they are, you need to reseal your wooden decks. Wooden decks in particular need to be kept clean and resealed as often as possible. Annual inspections and resealing procedures are your best bet to keep your deck looking beautiful. Maryland weather can be savage and temperamental, so you’ll never know what it could bring next – snow, hail, or even sun-rain. Labor Day is fast approaching, and it might be your last chance to fire up the grill. As long as you prevent grease stains, you shouldn’t hesitate to have that one last backyard barbecue. Grease is one of the trickiest substances to remove from your deck’s boards, so use a grease trap.